So here we are, back again with our first post of 2017! After a restful holiday break, we are getting into the swing of things with a new product feature for you. Oasis Beauty is the favourite this month – read on to find out why! Oasis Beauty is based in beautiful Oxford in Canterbury, with all of their products made locally in Christchurch. Natural and organic ingredients are used throughout their range. They specialise in sun care and skin repair for sensitive skin, don’t test on animals, and will even send free samples with every order made directly from their website! Their commitment to animals doesn’t stop at being cruelty-free. They are supporters of numerous charities including World Animal Protection and SAFE, and their Oasis Retreat, located nearby their HQ, provides a safe haven for rescued and re-homed furry friends. You’ll find amazing moisturisers, cleansers, and makeup among the Oasis range, but the product that sold me is their sunscreen. As an individual with (very) pale and mole-y skin, sun protection is pretty vital. Add to that my skin’s tendency to be sensitive, irritable and prone to acne… Finding a decent sunscreen has been a bit of a mission! 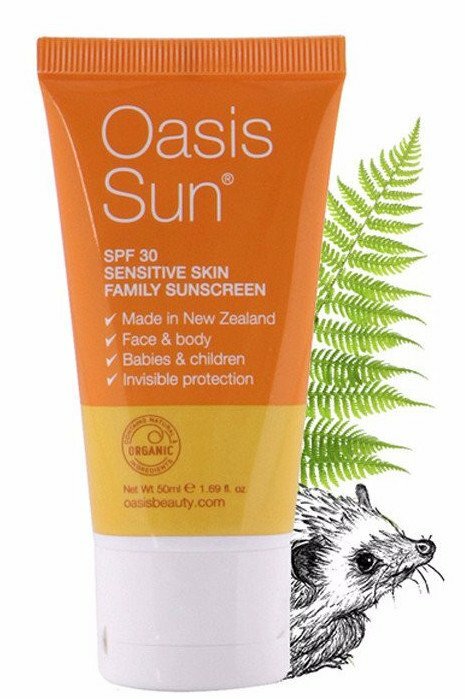 The Oasis range has been a huge relief for me, and just in time for the harsh New Zealand summer! I’m very grateful to finally have reliable and effective sun protection, all from a generous local company! Oasis Beauty get a big thumbs up from us, so why not try it for yourselves? Shop online or at any of their retailers across New Zealand, and find them on Facebook! P.S. Check out the video on their About page for some bonus info on their smart postal packaging!